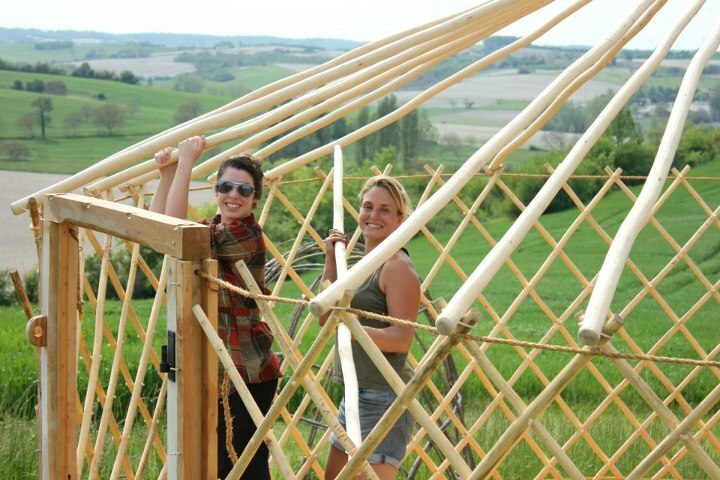 The yurts are up and we’re ready for another season! 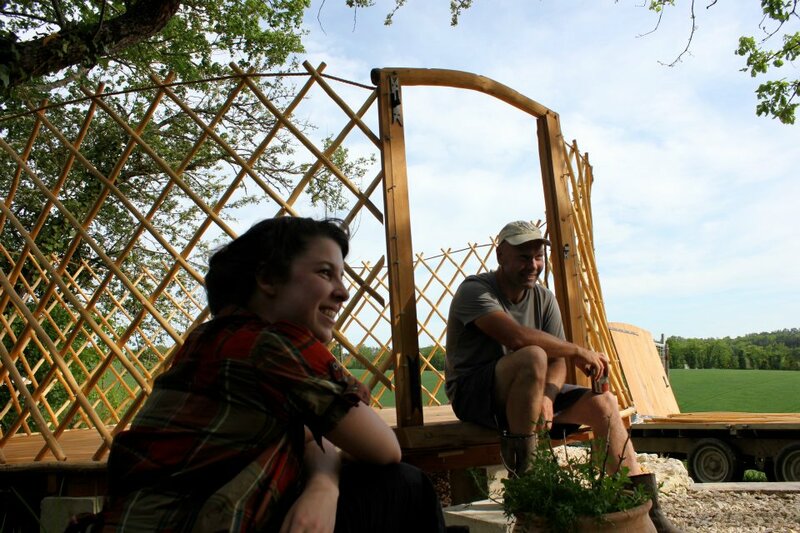 The actual putting up of the yurts is the easy bit, it’s the moving of the decks and setting them onto their plinths which requires the most effort, luckily we have my trusty steed (Massey Ferguson 135) to help and with the aid of a few willing volunteers we can set up pretty quickly. It’s always a very teamy thing with plenty of buffoonery and laughter and a celebratory drink at the end of the day. 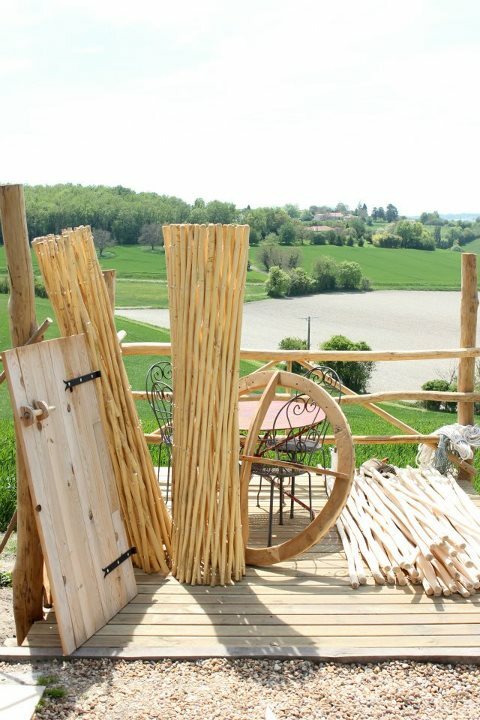 Many of the willow poles that were cut and graded in the winter have now been peeled and are drying ready for yurt building this coming winter. We find that you can avoid lots of the fungal, mildewy problems if the poles are well seasoned before you start. In order to keep the poles nice and white, after cutting in the winter we stand them in water (the right way up) and leave them until the spring when they will begin to burst into life. At this point using a shave horse and drawknife we can easily remove the bark revealing the beautiful white wood beneath. If the willow is dead the bark is much more difficult to remove and tannin from the bark is released into the wood giving it a buff colour. When cleaning the poles I like to leave pimples and knots, worm zigzags, bumps and wrinkles and any other natural imperfections, as I believe that this tells a story of the wood’s life. Sometimes you can trace a woodworm’s life through the marking it has left behind and the route it has taken may end in a hole where a woodpecker has found the worm underneath the bark and eaten it! I like the fact that we are not producing uniform broom handles with very little character even though it does make things more complicated further down the track when joining everything together, for me it adds to the overall beauty of our yurts. Crickey I do go on a bit, sorry I’m just excited about willow!! In other news, the kitchen garden and solar summer bathroom are coming along nicely. 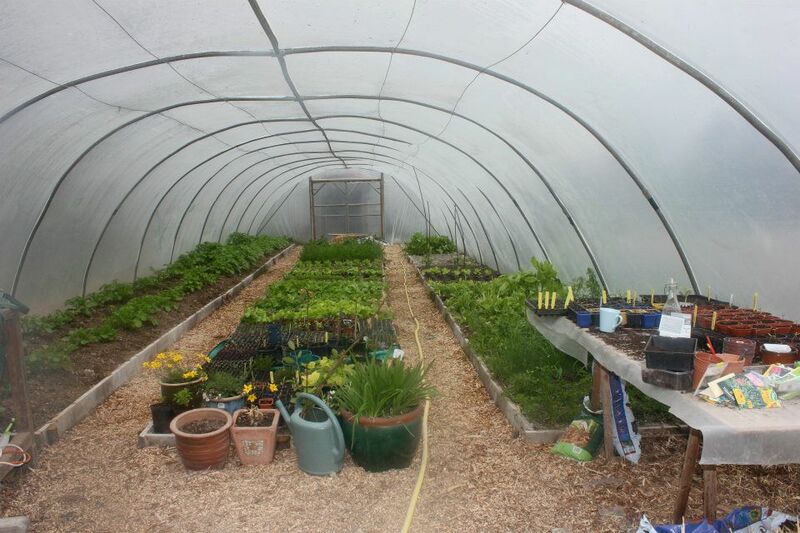 We are already getting salads out of the polytunnel and the new pathways in the kitchen garden have really tidied things up – I knew all those wood chippings would come in handy! I’m going to stop now before I start banging on about the joy that is willow again!